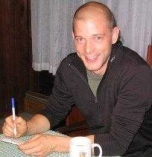 Brian Hone is a system administrator and software developer at E Ink corporation. In his spare time he surfs in very cold water and dangles off rock faces. Backup is one of the hardest and most neglected parts of system administration. It is also one of the most important. It is the last defense against hardware failures, security breaches, and the biggest threat of all: end users. While there are many backup systems out there costing many thousands of dollars, which archive to expensive tape drives using buggy proprietary software, there is a better way: Rsync and a cheap disk array. User: "I lost a file. I need you to get it back right away." SysAdmin: "Ok, what's it called?" User: "I don't know, I think it had an 'e' in the name." SysAdmin: "Ok, what directory was it in?" User: "I don't know, it could be in one of these three..."
SysAdmin: "*Sigh* Do you know what date you last used the file?" User: "Well....I think it was a thursday in either February or April. What's the problem? I thought you people had a backup system to take care of this kind of thing." Rsync is a powerful implementation of a beautiful little algorithm. Its primary power is the ability to effeciently mirror a filesystem. Using rsync, it is easy to set up a system which will keep an up to date copy of a filesystem using a flexible array of network protocols, such as nfs, smb or ssh. 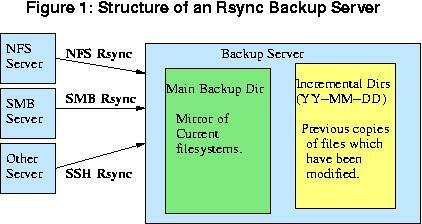 The second feature of rsync which this backup system exploits is its ability to archive old copies of files which have been changed or deleted. There are far too many features of rsync to consider in this article. I strongly recommend that you read up on it at rsync.samba.org. In general, a day's changes tend to be between a small percentage of the total filesystem. I find the typical average size to be between .5% and 1%. Therefore, with a set of backup disks which is twice the size of our fileservers, you can keep 50-100 days of incremental backups on hard drive. When the disk becomes full, just swap in a new set of disks, and move the old ones offsite. In practice, it is possible to keep over six months of incrementals on disk. In fact, if you can find space somewhere, you can copy your incrementals to another server before rotating the disks. In this way, you can keep an arbitrarily large number of incrementals on disk. Go back to the imaginary conversation above. Now, instead of a cumbersome tape-based system, imagine having six months of incremental backups happily waiting for you on your Linux box. Using your favorite combination of locate/find/grep, you can find all occurances of files owned by our imaginary user, which contain an 'e' and are timestamped on a thursday in February or April, and dump them into a directory in the user's home directory. The problem of figuring out which version is the correct one has just become my favorite kind of problem: someone else's. Next, imagine our favorite scenario - complete failure. Lets say you have a big nfs/samba server which you lose. Well, if you've backed up your samba configs, you can bring your backup server up as a read-only replacement in minutes. Let's see you try that with tape. Complete Failure Only option is full restore Can be turned on as a fileserver in a pinch. There are a lot of ways to set this up. All the tools here are open-source, included in standard distributions, and very flexible. Here, we describe one possible setup, but it is far from the only way. The Server: I use RedHat Linux. Any distribution should work, as should any UN*X. (I've even set this up with Mac OS X) One caveat: a lot of RAM helps. Disk:	The easiest way we've found of building a big cheap set of disk is a PCI firewire card connected to a bunch of cheap IDE disks in external firewire cases. Setting up Linux to use these as one big RAID partition is fairly painless. The Software: Rsync is a great tool. It is sort of a jacknife of filesystem mirroring. If you don't know about it, check it out at rsync.samba.org. Connecting to Fileservers: Rsync is very flexible. We use nfs and smbfs. You can also use rsync's own network protocol by running an rsync daemon on the fileserver. You can also tell rsync to use ssh for securely backing up remote sites. See the resources below for information of setting up these connections. -av: archive mode and verbose mode. Here's my shell script to tie it all together. Again, there are a lot of ways of doing this. This is just one implementation.